If you know me, you probably know about these individual potato gratins. Probably because I have gone on and on about how awesome these are. But seriously! The first time I made these, I decided then and there that Melissa D'Arabian was a genius. These little guys are such a good idea. 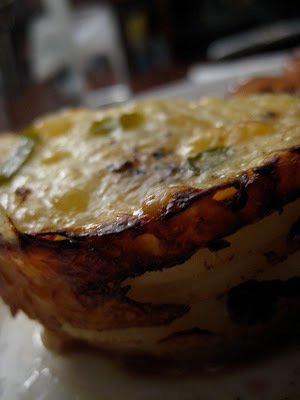 It makes the traditional potato gratin look kind of fancy! It is also perfect because each serving has the crispy edge. I love the swiss cheese and I am sure a fancy swiss cheese would be even better. These photos are from the first time I made this and I served it with green beans and chicken breast (made like Chicken Piccata but with lemon, rosemary and caramelized onions). Spray 8 muffin tins (the ones for jumbo size muffins work best) with vegetable spray. 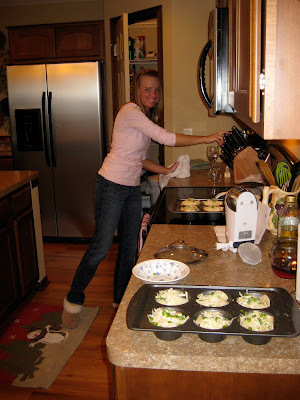 Layer potato slices, cheese, and onions into each muffin cup. Season with salt and pepper and top each gratin with 1 or 2 tablespoons of heavy cream. Cover with foil and bake for 30 to 40 minutes, removing the foil halfway through cooking time. Invert gratins onto plate and serve. PS: Some of my besties and I made these for our Christmas dinner, this past Christmas. In the spud world, these would be total babe potatoes :D Gorgeous! And utterly delicious, I'm sure!